Astrology is a fascinating, and controversial, subject for many readers. Some call it bunk, others won’t make a move without consulting their chart. 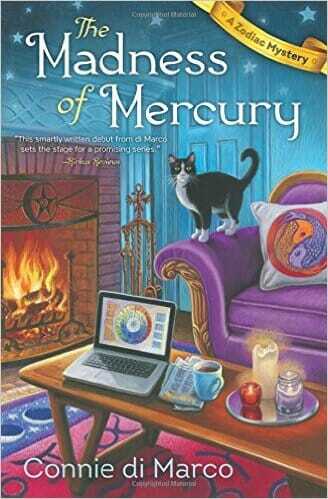 For Connie di Marco, astrology created the perfect background for her Zodiac Mystery series, which begins with The Madness of Mercury. I think of astrology as the next of kin to psychology, a frame of reference useful for character analysis. Learn more about Connie di Marco at conniedimarco.com. I”m really looking forward to this book. I asked the library to order it since it wasn’t on their order list yet. That’s great, Laura. Thank you! I get so thrilled when I find one of my books at a library! It feels as if the story will be immortalized for future readers. That was so thoughtful of you! Just love the cozies I can’t believe they are thinking of taking them away. I am hands down wanting to read and review this one. Love the backround on the comment page also! Hi Peggy – the good thing is that many other publishers are picking up cozy series — new ones and ones that have been cut from Berkley Prime Crime. I don’t think the market in traditional mysteries will ever die. So glad you’ve enjoyed the interview and the comments too. And I hope you get to enter Julia’s world very soon! Can’t wait to read “The Madness of Mercury “. Astrology and the zodiac seems like a great storyline for a mystery. Hi Dianne – I agree. The zodiac itself is a mystery. I thought a crime-solving astrologer would be great fun to write. Thanks for stopping by! A fabulous way to blend the mystical and the mysterious. I’ll be following these books and this author. Hi, Laurie! I’ll be joining you in following this series. Sounds like an exciting read, and a winner to me! Thanks! Hi Laurie – Thanks so much for your interest! I hope you enjoy all the stories in San Francisco! Yeah, of course not. Just trying to add a little humor there! The first dozen or so books I read before delving into the mystery genre as a writer were cozies. I must say, I learned a lot, especially the appeal of humor which I’ve incorporated into my Mac McClellan Mystery series. Again, thanks for featuring Connie–she’s a good one! Hi Michael ~ thanks for stopping by. You’re a brave man to admit to loving cozies! One question ~ does your detective Mac McClellan enjoy them too? LOL! I won’t tell a soul, Michael! Mac can always blame it on his girlfriend, right? Thank you, Michael ~ and the same to you! And thanks to Terry for hosting the first Zodiac Mystery!